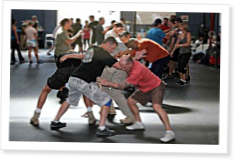 Tony Blauer is the brains behind the newest personal-safety specialty course to hit the CrossFit community: CrossFit Defense. Blauer, whose foundation is wrestling, martial arts and boxing, has been working with law enforcement and the military for years and was speaking Coach Greg Glassman’s language long before he knew what CrossFit was all about, long before Blauer even knew who Glassman was. But the two were evolving in parallel, and it was only a matter of time until Blauer and CrossFit’s CEO found each other. After doing a Level 1 CrossFit Seminar in California, Blauer was immediately on board the CrossFit train. Six years since meeting Glassman in Santa Cruz, Blauer is now totally immersed in the CrossFit community, and he’s the man CrossFitters turn to when it comes to personal safety. What follows are Blauer’s answers to 10 questions about his new seminar, which kicks off Nov. 3 at Valley CrossFit in Van Nuys, Calif. I have been a psudo crosfitter for the past 3 years, but I got out of the army and I have put on some weight again. I'm one of those skinny fat ppl now. I hate it. My health has plummettited as a result of this. I need some inspiration to start back up, you know...(get back on the ball!) I know that inspiration has to come from within. but could I get some words of encouragement, or kinda like a pep talk from somebody there? I really would appreciate it! As soon as I heard about S.P.E.A.R. I jumped all over it. I use it and no one has tested it yet. We will see where that goes.